The Dragon Boat Festival this year fell on June 18. However, a dragon boat race nowadays takes place any time in a year in several countries. People participate in the dragon boat race in Ljubljana, Slovenia, on June 16, 2018. 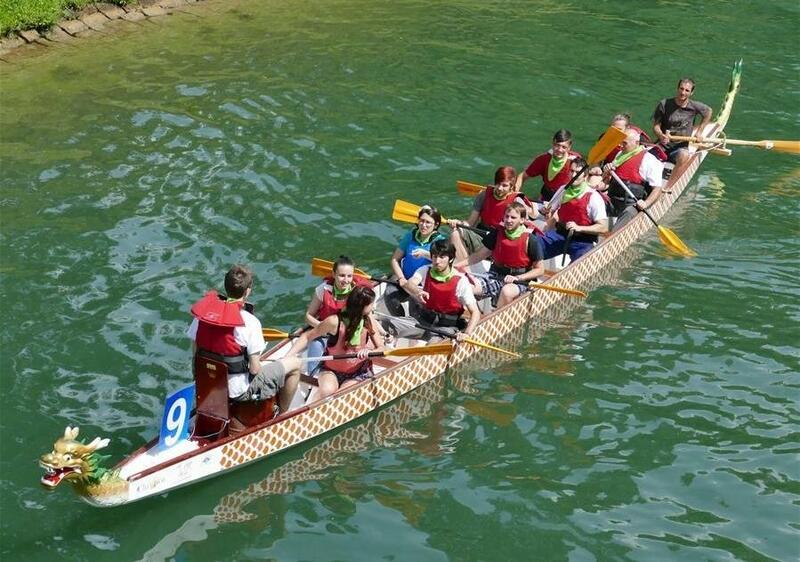 A dragon boat race was held on the Ljubljanica River in Ljubljana on Saturday. The event was organized by the Confucius Institute of the University of Ljubljana to celebrate Chinese traditional Duanwu Festival, or Dragon Boat Festival. The Dragon Boat Festival was celebrated among overseas Chinese communities worldwide over the weekend with the specialty food zongzi, but not necessarily a dragon boat race, both widely seen as its logos. Dragon boat racing is officially a competitive sport played under rules set by the International Dragon Boat Federation. This is something beyond what the Chinese people could imagine some 2,500 years ago when they took boats to distribute feed in a river trying to keep fish from disturbing the permanent rest of patriotic and beloved poet Qu Yuan, who chose to die along with his doomed country. The move inspired a water sport and a rice food, and accidentally,changed the face and the name to be known abroad of an old Chinese festival focusing on health and epidemic prevention -- the 5th day of the 5th month of a Chinese lunar year which coincidentally marks the death anniversary of Qu. It is one of Britain's fastest growing water sport as well as a highlight in London's cultural calendar. On June 3, the 23rd edition of the annual London Hong Kong Dragon Boat Festival entertained 10,000 visitors. Hundreds of players, among them teenagers, elders, amateurs and corporate employees, of 33 teams from across Britain paddled vigorously to the beat of each team's own drum and amid stormy cheers from the bank, competing for six cups at London's Regatta Center. "I have never, ever experienced anything like it. I think it is amazing. I found it is really interesting, but honestly, I do not know much about it," Stephanie Ann, a local visitor coming with her family, told Xinhua. On the sidelines, live music, traditional Chinese lion dances, and an Asian food market are among the diverse cultural activities contributing to the biggest dragon boat races in Europe. In the United States, dragon boat racing is popular in cities including San Francisco, Kansas City and Boston. In New York City, it has become the largest local summer event. The 28th annual Hong Kong Dragon Boat Festival in New York is scheduled for August 11-12, and more than 200 well-trained teams will participate. "I'm captain and drummer, we have a new steerer this year and we are moving into using the fiber glass boats instead of the timbre boats for the race," Julia Chesler told Xinhua after a three-hour team training recently on the Meadow Lake, the race venue. Still, somewhere, the old-fashioned dragon-headed boats strongly suggest a cultural background, indicating a close link of the sport with China. "It was quite a good experience...I will remember it because it is something we associate with Chinese culture," said Din Musovic, a high school student of the champion team from the June 9 race held in Croatia's capital Zagreb to mark the upcoming Dragon Boat Festival. At least, the dragon boat's unique shape is eye-catching. On Saturday, a dragon boat sailed in a canal running through downtown Aveiro in northern Portugal, interesting many people. The sailing proved to be the most dramatic part of the local Dragon Boat Festival celebrations. City official Catarina Barreto praised the celebrations co-hosted by the Confucius Institute at the University of Aveiro, saying they brought together the traditional cultures of Portugal and China and called for more. Uganda saw the 2nd edition of its Dragon Boat Festival on Saturday on the shore of Lake Victoria. It turned out to be a big event with barbecues, kite flying, live music, Chinese and Ugandan food, performances of Chinese waist drums and Ugandan folk dance. Its opening ceremony was attended by Uganda's Vice President Edward Kiwanuka Ssekandi and a visiting Chinese official. "I'm sure this Dragon Boat Festival will be an avenue to make Ugandans and Chinese (migrants) live more happily together and cooperate better," Ssekandi said, adding that the dragon boat race integrated elements of the two countries' traditional cultures. Addressing the opening ceremony, Wang Yang, chairman of the National Committee of the Chinese People's Political Consultative Conference, said dragon boat racing embodies traditional Chinese values such as mutual benefit, seeking harmony in diversity, and working in unity and cooperation. Traditional Chinese festivals can always be tasted, and the Dragon Boat Festival is no exception. Zongzi, a glutinous rice dumpling wrapped in bamboo or reed leaves in cone- or pyramid-like shapes, is the special treat and delicacy on the festival table. It was purely good luck that led Frank, a German visitor who only gave his first name, into Lao Sze Chuan in downtown Chicago on Sunday, who ordered for friends a debuted special offer by the Chinese restaurant. It was a zongzi stuffed with pork and duck egg yolk amid rice. "It's really a good combination of flavors, I really enjoyed it... It's worth a shot," he commented. "I was actually quite surprised." The restaurant said guests consumed more than 280 pieces of zongzi in less than three hours. But for Richard Hennessy, it was more than a pleasing dining experience -- he took the invitation to make zongzi with the help of cooks. Hennessy believed the zongzi he made was the star of the night. "It's a great fun. Now we can go home and practice some more," he said. Although modern life facilitations enable the zongzi made in China to be only a few clicks away, restaurant owner Tony Hu plans to make zongzi-making a Dragon Boat Festival routine. "Chinese food is the easiest way for them to know China, and cut short their distance with Chinese people," said Hu. Zongzi has been a food mostly family-made in China, and many Chinese learn the knacks of making it from their parents. It is a good example to show traditional Chinese values -- the cooking activity calls for collaboration among family members, with its results shared by all. For many Chinese, making zongzi never fails to evoke a feeling of being at home. "On a festival like this, we want to help with the homesickness of Chinese living abroad, and introduce traditional Chinese culture to people here," said Zuqi Su, co-owner of Chinese restaurant Jasmine in downtown Manhattan, New York, which offered a zongzi making workshop on Saturday and Sunday. Anirudh Singh did his homework on Chinese culture before participating in the restaurant's Dragon Boat Festival celebration. "The fishermen threw rice in the river to make sure the fish didn't eat Qu Yuan's body, right?" he said. "I learnt all about it before I came here." Do It Yourself was partly why the workshop charmed Thomas Hasler, an Austrian among the more than 100 participants. "I enjoy this so much," he said. "I eat out a lot at Chinese restaurants, but being able to make something has been so much more fun."